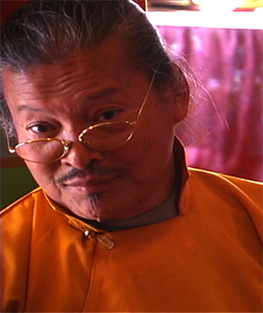 Lopön Nikula is a a Bhutanese lama and a senior disciple of Dudjom Rinpoche. He accompanied and served Dudjom Rinpoche for many years during his life in exile. While serving as his personal secretary, Lobpön Nikula worked with Dudjom Rinpoch to organize his 'Collected Works' and his revision of the whole Nyingma Kama. Having mastered every aspect of rituals in the Dudjom Tersar tradition, he also served as Dudjom Rinpoche’s umdzé and chöpön. Lopön Nikula spent a lot of time with Lama Nagpo Pema Wangchen. He was also a close student of attendant to Thinley Norbu Rinpoche, Dudjom Rinpoche's son, and is now close with Dzongsar Khyentse Rinpoche, grandson of Dudjom Rinpoche. He is now serving as the vajra master and lama for the Court of the Royal Family of Bhutan. This page was last edited on 14 February 2018, at 07:24.